Knee deep in mud with a failed automatic hub and a disabled vehicle, the only way to repair it is to replace it. The question is, with what? Factory automatic hubs have a history of failing when you need them most. A damaged hub will render your 4x4 useless and leave you stranded. Wish you could swap your venerable automatic hubs to a set of manual locking hubs? Rugged Ridge has heard your plea. 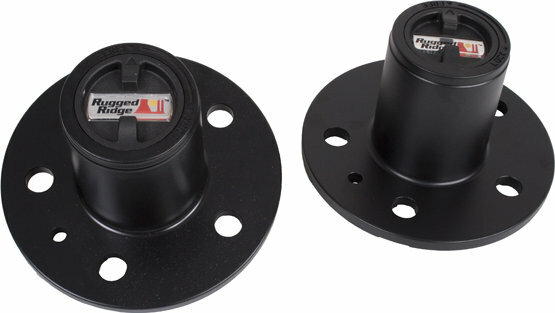 Rugged Ridge Manual Locking Hubs are unanimously recognized as the worlds toughest hubs by our thousands of satisfied customers worldwide. Brute strength matters, that is why the bodies of our hubs are crafted from impact resistant nodular iron, and feature a corrosion resistant die cast aluminum cap. Our hubs deliver better 4WD performance when locked and improved fuel economy in 2WD when unlocked, than automatic hubs. Purchasing a set a premium manual hubs is more cost effective than servicing hubs is more cost effective than servicing your worn factory hubs. With the money you save youll be able to carry a spare set, not that youll need them. Sure you have to get out of the cab to lock the hubs, but unlike automatic hubs you wont have to wait until you lose traction for your four-wheel drive to engage.